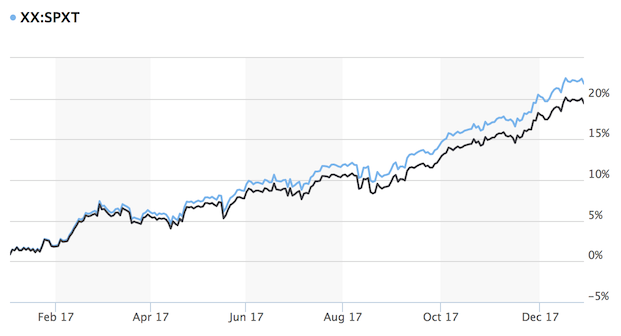 The S&P 500 Price index returned +18.74% in 2017. Using a better calculation which includes dividend reinvestment, the S&P 500 returned +21.14%. Whichever set of return time-spans you prefer, the message is the same as last year’s: dividends matter. If you invest in funds or stocks that pay a dividend you’ll have to choose what to do with the payouts. Simply quoting price returns without regard to real returns in cash form doesn’t reveal the true impact of an investment. Lump sum investment return calculator. A calculator which also layers in estimates for fees and taxes. It allows periodic scheduled additions to an investment. This calculator works on constant time-frames in the S&P 500 dataset, calculating an ordered set of returns. Computes the 10-year PE ratio of the S&P 500 index. Also lets you change the period of returns to include in the data. Adding dividend reinvestment to the math moved the needle from under 20% to over the psychological barrier. (Due to round number bias, it’s a significant difference to us humans). It’s also the right way to look at the returns. Unless you burned the dividends you received in 2017, you had to make some decision on what to do with that cash. Nowadays, many investing accounts allow you to automatically reinvest these dividends, giving you returns that closely approximated the numbers quoted here. Of course, your mileage may vary. Taxes, slippage, timing, fees, availability and other factors would have changed your exact results… but the point remains. Dividend returns are real returns and it was an excellent year for the stock market. What do you see the S&P 500 doing in 2018?